I woke up this morning greated by thick fog and the freezing air, defiantly time to reach for them woollies and coats! Autumn and winter fashion is defiantly my favorite, dark mellow colours, different textures and lets face it, feeling cosy. Here are three outfits that I LOVE, however I've done my research to find more affordable items to recreate this look. If you like this style of blog, be sure to let me know, hope you enjoy! I personally love this style of outfit, whether you're wearing it to lunch, shopping or just college it's simple but girly. The colours compliment each other and instantly make me think of Autumn as they are rather dark tones. This outfit is seriously cute! Turning something so simple like a spotty skater dress into a chick outfit is right up my street. I love the cute collaring which sits perfectly on the cable knit jumper, because lets face it we all need added warmth anyway in England! Tartan I feel has become increasingly popular and not just the Scottish trade mark, however it's now a fashion staple for many. 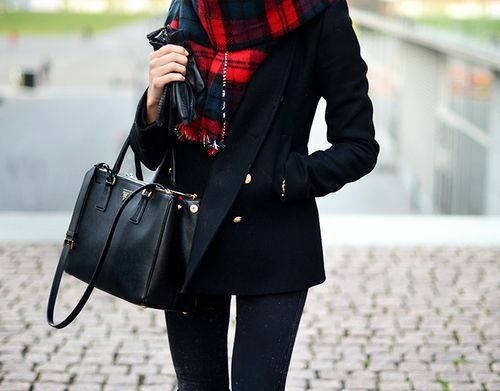 I adore how this outfit is really simple and black however the pop of red and green adds colour as well as warmth, perfect for them chilly nights out! i love these outfits! they are so cute and warm for fall! Gorgeous post! thank you for sharing! Thank you, it means so much!